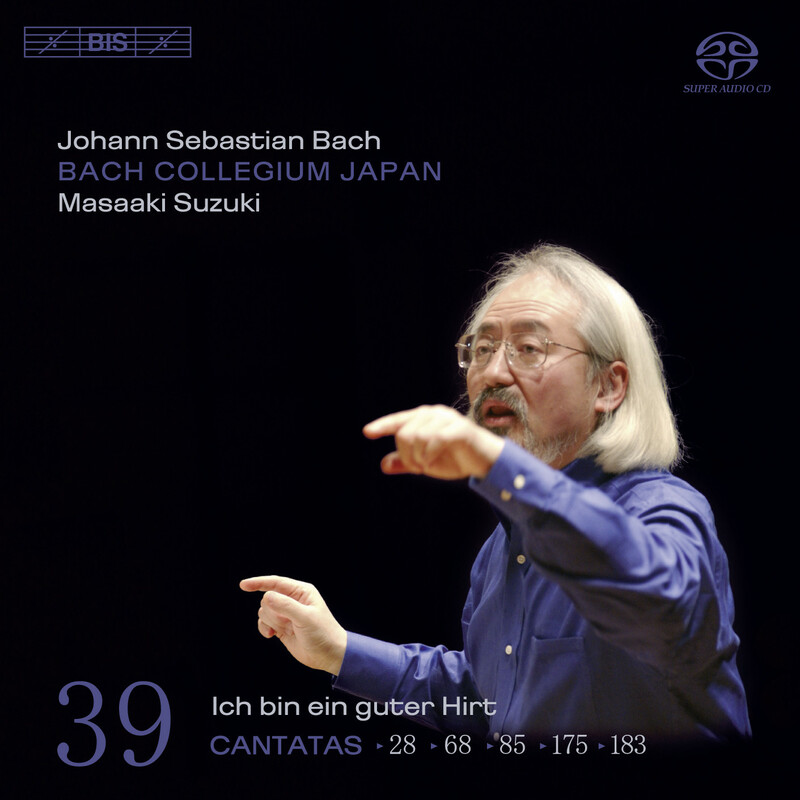 After two volumes concentrating on solo cantatas, the full forces – including the splendid choir – of Bach Collegium Japan return in this programme of five cantatas dated 1725. The choir instantly makes its presence felt in the first movement of the opening work, BWV68. This is a large-scale hymn arrangement, where the choir is supported by an orchestra including horn and oboes. This is followed by one of the most charming and beautiful soprano arias in all of Bach’s cantatas, ‘Mein gläubiges Herze’, in which Carolyn Sampson shines. The five works all include various more or less unusual instrumental combinations, from the three recorders which lend a pastoral character to Er rufet seinen Schafen mit Namen, BWV175, to the wind quartet (two oboi d’amore and two oboi da caccia) appearing in Sie werden euch in den Bann tun, BWV183. The variety of timbres is further aided by the appearance of the cornet and trombones of Concerto Palatino, as well as that of Dmitry Badiarov performing the important and soloistic parts for violoncello piccolo on his own reconstruction of a violoncello ‘da spalla’ (‘of the shoulder’). Apart from Carolyn Sampson, the vocal soloists are Gerd Türk, who glows in the intensely melodic tenor aria ‘Seht, was die Liebe tut’ (from BWV 85), Peter Kooij, whose bass becomes the voice of Christ in Ich bin ein guter Hirt, (BWV85), and Robin Blaze having a fine moment in the expressive alto aria Komm, leite mich (BWV175). All in all, another impressive instalment in this highly acclaimed cycle.